Doctors at Montreal’s L’hôpital Pour Les Enfants Laids [Hospital For Ugly Children] have closed the case on Celine Dion’s son René-Charles, saying that the child is not ugly and they are moving on to monitor the baby that the Canadian diva is now carrying. The boy, René-Charles Dion Angélil, had been under close observation since his birth in January 2001. Genetic specialists had counseled Dion and her husband that there was no way Dion could have a baby that wouldn’t scare the bejesus out of ordinary people. Doctors had even harvested stem cells from Bradd Pitt and Tom Cruise which they planned to inject right into the kid’s face in the event that the his ugliness began to rear its ugly head early on — but it didn’t. “Normally we accept ugly babies at the moment they are born and deemed to be ugly by the doctor’s in attendance,” said Dr. Francois Galinette of the hospitals Center for Hideous Baby Case Management. Doctors had been closely monitoring the child because they feared that he would mature into a monstrosity, but it soon became apparent that the child was some kind of gentic freak who inherited genes from perhaps hundreds of generations back. Doctors are seriously concerned about the baby Celine is now carrying. Comedy's newest "HAS-BEEN" Kathy Griffin wants to go back to 2006. Steven Slater dismissed from Jet Blue and Miss Fern's School too. I am a big fan of your website..it is very entertaining and quite topical. Two words for you, Linda: Reading comprehension. If you bothered to read the story, it talked about how doctors are surprised that he is a nice looking little boy and that he is indeed cute — not a monster like his parents. 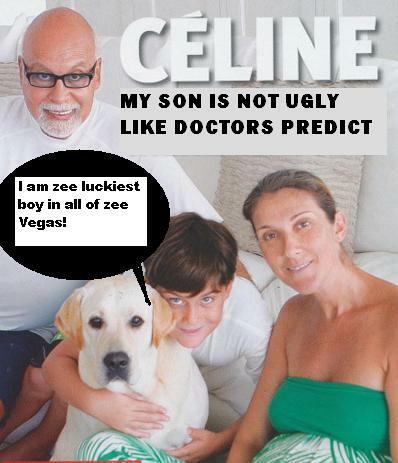 I love Celine and am a big fan, she really has talent and her marriage is beautiful however this is soooooo funny!!! Despite how much i like Celine her and her husband are soooo not good looking. It is a miracle that Rene-Charles is cute, I just hope they will keep his hair cut and stop acting like hippies. Thats all we need three long haired, spoiled freaks running around! Yes, Nessa. It is zee Christmas miracle of zee year. Now we have to wait and see if the new twins grow up to look like gargoyles 🙂 Thank you for your comment. I love you¡!!!!!!!!!!!! !ty for seeing her fakeness and grossness,and putting it into a hilarious article. UPDATE LIZZIE!!! UPDATE!!! Have you seem recent photos of the kid — now that he’s about 20 — Oh dear — the chin….the chin…it has finally evolved into a frightening thing. Sorry, but the doctors were wrong. From the eyes up he is nice looking….but then….well, you know the rest.